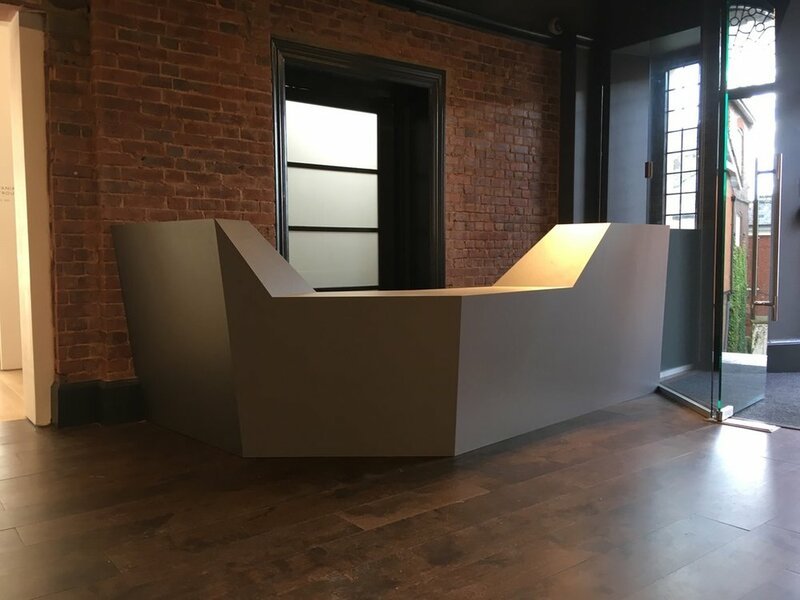 We were commissioned to design, make and install a bespoke front of house reception desk as part of a larger refurbishment project for the well established Exeter Phoenix Theatre. The desk was designed to compliment and sit with a new inner glazed curtain wall entrance space by long-term collaborators Veon Glass. The brief was to create a multi-faceted monochromatic structure that would be stylish and hardwearing, whilst echoing an aesthetic language familiar and true to the Theatre. We designed the desk to be digitally fabricated using 24mm birch ply with a laminated top surface. The desk is entirely freestanding and the geometry is complex, with all of the junctions being mitred. Subtle variations of grey have been used to dramatic effect for the public facing side, which is accentuated by the light play on the piece as a whole. Services - concept design, technical design, fabrication drawings, on site installation.